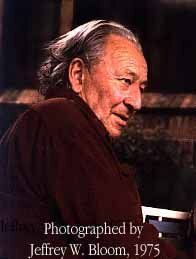 The Neurological Levels concept was developed by Robert Dilts (1990) taking much of his inspiration from the work of Gregory Bateson (leading anthropologist, philosopher and seminal figure in the early development of NLP – particularly his Logical Levels of Learning construct (1972). For this model of abstracted levels of what we learn and how it affects us, Bateson himself drew on the Logical Typing of mathematician and philosopher Bertrand Russell (1910). Taking his cue from Bateson, Dilts conceived a hierarchy of levels the mind uses to order its relationship with the world. Dilts linked these ‘Logical Levels’ to neurological functions and structure of the brain. Thus, Neurological Levels! While the supposed ‘logicality’ of the model has been attacked and the way Dilts’ has used neurology is sometimes open to question – see Peter McNab’s Article, Aligning Neurological Levels -a Reassessment (1999) – almost everyone who has worked with the model testifies to its power to describe what we might call Nominal Level Adaptation. (See: Integrated SocioPsychology.) In other words, the match of Identity – and the Values & Beliefs which flow from Identity – to the Environment in which we find ourselves. 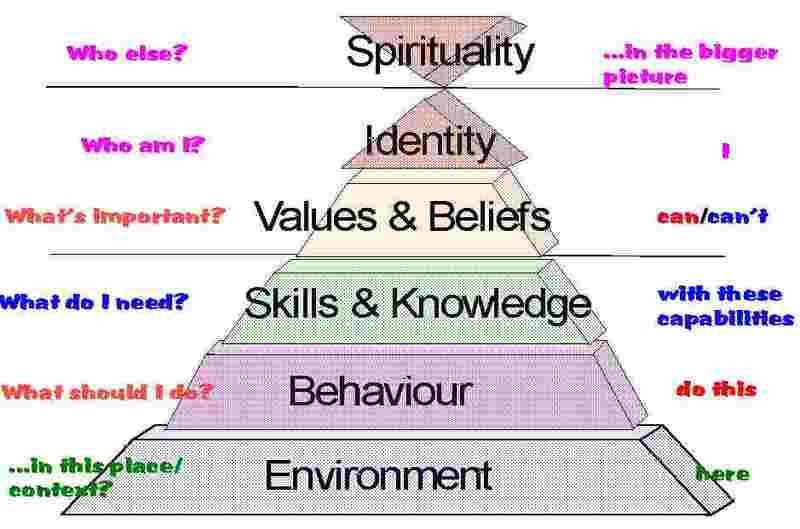 The key to a healthy psyche (selfplex), according to Dilts, is to align the levels from top to bottom so that the Identity has the Values & Beliefs to acquire the necessary Skills & Knowledge to demonstrate Behaviour appropriate to the Environment. For example, someone who is a teacher (Identity) would almost certainly behave differently in the classroom (Environment) to when they were being a worshipper (Identity) in a church (Environment). The way in which Dilts perceives Identity to shift from Environment to Environment reflects Erving Goffman’s (1959) Dramaturgical Approach in which Goffman portrays people as actors, wearing ‘masks’ for different people and contexts to achieve impression management. Many of the identities Dilts and, for that matter, Goffman point to are also social roles – eg: father, husband, teacher, householder, citizen, etc, etc. Peter Berger (1963, p112) sees the behaviours that generally result from adopting a social role as “a typified response to typified expectations”. Where the neuroscientists have found Dilts’ attribution of brain structures to functioning of the levels to be phenomenally perceptive is in the relationship between Values & Beliefs and Skills & Knowledge. Skills & Knowledge (aka Capability) involves higher level processing primarily in the cerebral cortex of the brain. Here mental maps are formed from sensory information, other mental representations and imagination and plans are made. However, Values & Beliefs – which relate to the question, ‘why?’ – are also associated with the limbic system and, in particular, the amygdala’s stimulation of the hypothalamus. The limbic system’s integration of information from the cortex and regulation of the autonomic nervous system means that physiological changes such as tingling of the skin and increase in heart rate often occur when we are operating at this level. However, the amygdala can react to certain sensory information faster than the cortex can evaluate and plan, resulting in what Daniel Goleman (1995) calls ’emotional hijacking’. People can act before thinking and without any sense of consequences when their Values & Beliefs are challenged! See Dilts’ Brain Science for further information on the neurological workings of the model. In the Dilts hierarchy, the higher the level change takes place at, the greater the impact upon the whole. Which doesn’t rule out change at the lower levels impacting upwards – though this is far less likely and is also less likely to be sustainable. It is the association between the higher neurological levels and vMEMES which provides a key element of Integrated SocioPsychology. Some years ago I was ‘walking’ ‘Harry’ through his neurological levels – an exercise Dilts developed for gaining enlightenment from non-conscious processing. When he reached the Identity level and I asked him what his mission in life was, Harry turned around, tears streaming from his eyes, and said, “Mission? I don’t have any mission. I don’t have any idea what I’m doing here. I just live day to day. Like a dog.” That confirmed to me what I already suspected: that Harry was stuck in a RED paradigm which wasn’t working for him in a particular situation requiring a more complex Identity and set of Values & Beliefs. Such is the power of the Neurological Levels model that it can be applied across 4Q/8L’s Lower Quadrants to groups and organisations as well as individuals. A number of consultants and business advisers have used it as an analytical tool on business planning projects. The results of one such analysis I carried out can be viewed here. Identity is a key issue in many psychological and sociological theories, making another reason for Neurological Levels being so important to the development of Integrated SocioPsychology. For example the effect of Identity upon Behaviour means neurological levels have implications for understanding modelling in Albert Bandura’s Social Learning Theory. Identity is also especially important in the work of Carl Rogers, Erik Erikson and James Marcia. With this, Bateson certainly allows for a ‘collective consciousness’ and a sense of ‘interconnectedness’. Dilts has acknowledged the therapeutic value of the spiritual dimension on many occasions. However, neither has really taken the concept as far as Ken Wilber does in his Integral Psychology (2000) and Integral Spirituality (2006) concepts. Equally, it could be argued, from the work of Abraham Maslow and Clare W Graves that spirituality, in the sense that Bateson and Dilts meant it, is a consequence of TURQUOISE/Transcendence thinking.